On March 15, 1891, a lynch mob of thousands descended upon the city jail. The destruction and terror caused by this well-orchestrated mob reverberated well past this day, affecting local and global politics in the decades to come. Armed with guns, large wooden sticks, and heavy stones, and intent upon killing recent Sicilian immigrants and Italian-American citizens being held there, the mob broke into the jail and murdered nine men; they then dragged two men out into the street, strung them up, and shot them as the massive crowd watched. One of the victims was a powerful shipping magnate, the rest were largely unknown. The vitriolic mob sought vengeance for what they claimed was the wrongful acquittal of these men in a trial for the 1890 murder of Chief of Police, David Hennessey, but in a larger sense they were fueled by a local and national news media that insisted Sicilians and Italians, more generally, were a class of immigrants prone to violence and criminality. A week before the lynching, the local Daily States reported: “the chiefest danger to our social system...is...the vagaries of other nationalities. Unfortunately, the most inconsiderate of these we have found to be the Sicilian. In numbers they are a dangerous proportion among us.” In this moment, the threat of the secretive “mafia,” with its “vendettas” and underground networks--now a well-worn set of stereotypes--was injected into public consciousness. A day earlier, the city’s newspapers, political leaders, and elite businessmen had called for a mass meeting and rallied the crowd that gathered to seek retribution. “Come prepared for action,” read the newspaper insert. Mayor Shakspeare insisted: “we must teach these people a lesson that they will not forget for all time.” For decades local newspapers had portrayed the Sicilians recruited to work on sugar cane plantations and in the city’s busy port as hard-working and good candidates for citizenship, but they now claimed that the criminal tendency was innate in the “brutal” Sicilian. This lynching, generally considered to be the largest in U.S. history, was part of the larger phenomenon of white Southern mobs that targeted and terrorized African Americans, but which also murdered dozens of Italians in the Jim Crow era. This white violence was fueled by economic and political motivations. In New Orleans, white elites sought to limit the control the new Sicilian working class immigrants were gaining over the docks in their cross-racial labor organizing with African Americans, and, for a few established Italian-American upper-class men, in the shipping industry as well. Various local and state leaders sought to intimidate Italian-American citizens into voting to limit civil rights for African Americans. White Democrats of varying political factions sought to consolidate their power by condemning recent Sicilian immigrants and citizens of Italian descent with the stereotype of “killer dago,” leaving them with an unprotected status. Mayor Shakspeare claimed to be unable to prosecute the leaders of the lynch mob, despite the appeals of the Italian government and federal condemnation of the violence. While the Italian government lobbied for the passage of a federal anti-lynching bill that would have made it a federal crime to lynch non-citizens protected under international treaties, it never passed. Ultimately, the U.S. government paid $25,000 to Italy in reparations for the victims’ families, but no other attempts were made at bringing about justice for those murdered by the mob. 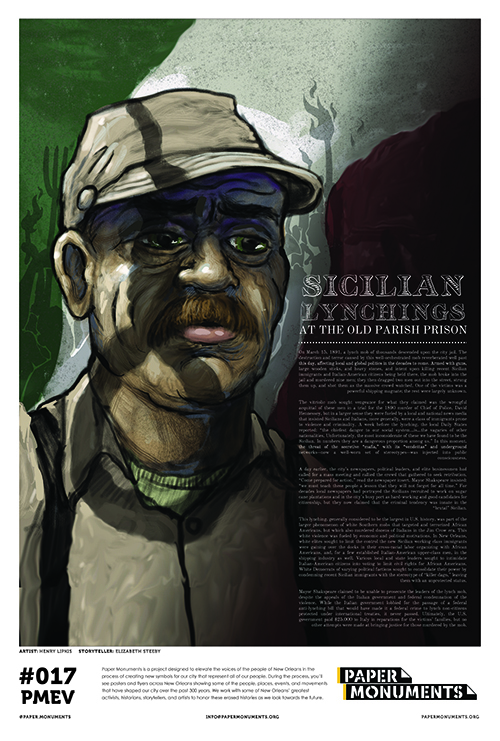 Paper Monument Poster #017: Sicilian Lynchings at the Old Parish Prison ~ Source: Courtesy of Paper Monuments. ~ Creator: Paper Monuments ~ Date: December 2018. Paper Monuments is a project designed to elevate the voices of the people of New Orleans in the process of creating new symbols for our city that represent all of our people. 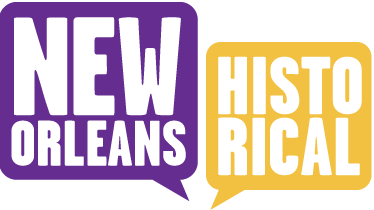 During the process, you’ll see posters and flyers across New Orleans Showing some of the people, places, events, and movements that have shaped our city over the past 300 years. We reached out to some of New Orleans greatest activists, historians, storytellers, and artists to honor these erased histories as we look towards the future. Paper Monuments, Henry Lipkis, artist, and Elizabeth Steeby, storyteller, “Sicilian Lynchings at the Old Parish Prison,” New Orleans Historical, accessed April 19, 2019, https://neworleanshistorical.org/items/show/1452.